It’s Friday and in the Corder house that means it’s PIZZA Night!! Really anything goes, we order in, we bake up some frozen, I make them from scratch…doesn’t matter as long as it’s Pizza. Hot and doughy, saucy and cheesy!! Plain cheese or piled high with veggies and/or meats. 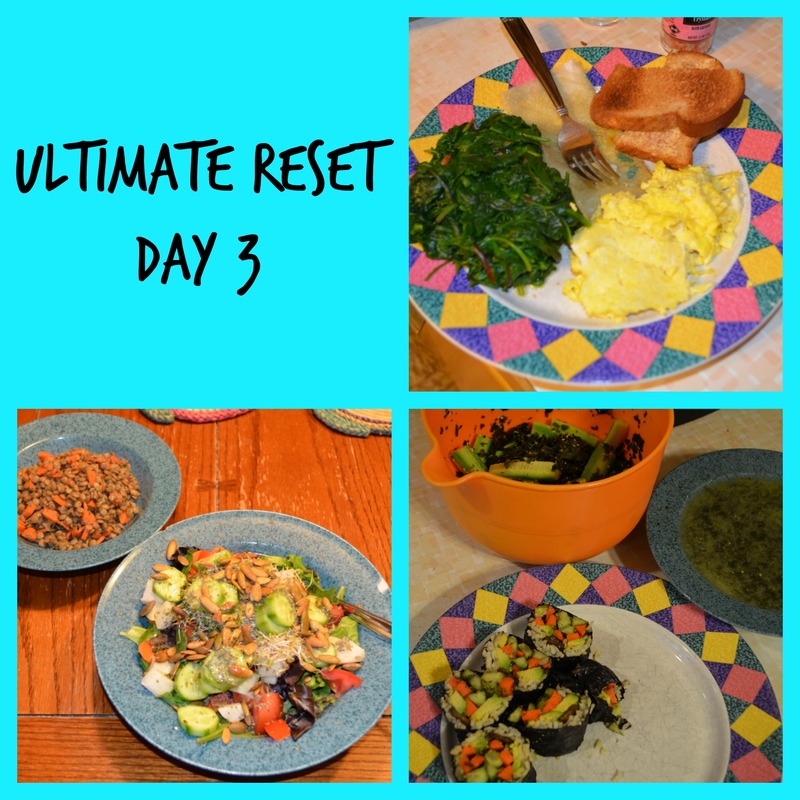 But Alas, it’s Day 3 of The Ultimate Reset which means no Pizza for me and Jimmy 🙁 And he was NOT happy about that, but he’s in this with me so we started our day with 12 oz of water and moved on from there. I woke up feeling very tired today and my joints were achy. Breakfast was great. One of my staple first meal of the day. Eggs, toast, and steamed kale. So darn filling and full of nutrients. Lunch time came and we got to eat TWO HUGE salads. Lentil salad and Micro Green both with a light flavorful dressing. Too much to finish. And then came dinner…OH NO!! 3 different things to eat and each was made with SEAWEED ~ WHY Carl? WHY do you torture us this way? I know darn well YOU are NOT eating SEAWEED and if you are, we need to talk cause this stuff is nasty! While Julia and Pete enjoyed some frozen pizzas tonight, we got to enjoy Seaweed ~ YUM, YUM! NOT!! I was actually proud of my first Nori Roll 🙂 Not perfect, but it looked really good and it tasted good too! I forgot that we could use some Bragg’s Liquid Amino for extra seasoning and flavor, so that was a bummer cause I could definitely taste the ocean. We got another bowl of Miso Soup and tonight I blended up the seaweed and added a little Himalayan Salt and it made it more enjoyable. Our final dish was Japanese Cucumber Salad…..WOW this was one of the most horrible things I have ever eaten. It was so BAD, that I could NOT eat it!! I pulled out the cucumbers, cause I love those and I hate to throw food away. And that’s a wrap on Day 3!